Not quite an SUV, but also not a minivan, the boldly styled 2015 Ford Flex offers a unique twist on the family wagon. The 2015 ford flex electric vehicle qualifies for a federal tax credit of up to $7,500, effectively reducing the net base price. The Ford Flex for 2015 is far from typical. In fact, it only takes one look at its boxy silhouette, grooved side panels and long white-capped roof to see that the Flex is the true heir to the classic American family station wagon. Although the Flex crossover SUV doesn't have the ground clearance or off-road capabilities of the Honda Pilot or Ford Explorer – although it does offer all-wheel drive (AWD) – it does offer similar midsize-SUV interior dimensions, plus the advantage of a more comfortable ride and lower step-in height. The Flex also gives you a choice of powerful yet fuel-efficient engines, a near luxury-car-like interior, and plenty of cutting-edge features to please even the most stubborn tech junkie. If you need room for the kids and all their stuff, but can't abide the idea of a minivan, the 2015 Ford Flex is the obvious solution. Its smooth ride, spacious interior and dynamic styling are augmented by an available turbocharged engine and AWD. If towing more than 4,500 pounds, going off-road or plowing through deep snow are part of your SUV experience, the Flex is not the midsize SUV for you. A V8-powered Dodge Durango or Nissan Armada might be more what you had in mind. For 2015, the Ford Flex gains heated side mirrors on the SE trim, push-button start for the SEL, and a heated steering wheel for the Limited model. Some new colors round out the major changes. Despite its wide and long body, Ford's Flex crossover SUV for 2015 manages to feel maneuverable and responsive, even in tight situations. The Flex demonstrates impressive poise in sharp turns, remaining relatively flat when cornering but delivering somewhat numb feedback through its electric-assist power steering. Sway and body roll are kept to a minimum, and ride comfort is above par for this class. The interior is also well isolated from outside noise, although that varies somewhat depending on wheel and tire size. Power from the base V6 isn't bad, but we prefer the 365 horsepower offered by the EcoBoost V6. When so equipped, the Flex offers up more power than any rival V6, and even more horsepower than the Hemi-powered Dodge Durango. The optional all-wheel drive operates seamlessly and brings an added measure of safety and capability when the weather turns nasty. Pick the Limited trim with 2nd-row captain's chair seating and you can opt for a center console with a built-in refrigerator. This cool idea can hold up to seven 12-ounce soda cans or, because it can cool to 23 degrees Fahrenheit, even a few pints of ice cream. Ford's latest SYNC communications and infotainment system includes a voice-activated command center that can retrieve music, make or receive phone calls, and even read text messages aloud, helping you to keep your eyes on the road. Ford worked hard to make the 2015 Flex a special place to be. The inviting interior is functional, elegantly appointed and meticulously assembled. The Flex's instrument panel is clean and functional, with the three screens for the MyFord Touch system. A massive 4-panel Vista skylight is one of the noteworthy features. The 2nd-row and 3rd-row seats fold flat, and so does the right-front passenger seat, creating what feels like acres of cargo space. For hauling people, the front and middle rows provide spacious and comfortable accommodations for four, or five in a pinch. Third-row occupants will find legroom a little tight. The Ford Flex for 2015 looks functional and quirky, but still timeless. Think vintage Ford Country Squire meets Mini Cooper. It's a box, for sure, but an elegantly detailed box, with aero-friendly contours and soft edges. The Flex's face is quite modernistic, with a strong horizontal character and some unconventional treatments in the relatively subtle headlights and prominent Flex name in chrome across the nose. A liftgate clad in brushed aluminum and the optional contrasting-color roof are also strong visual elements. This "flying brick" shape may not appeal to everyone, but it's a distinctive way to build a family hauler. 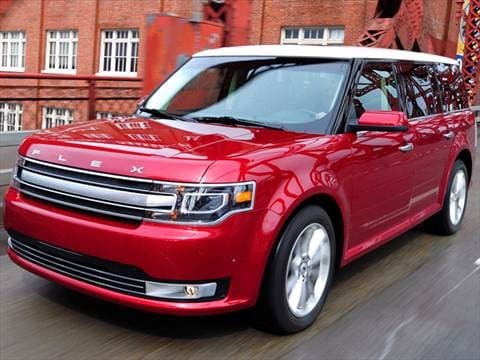 The 2015 Ford Flex comes in three trim levels: SE, SEL and Limited. Standard equipment includes keyless entry, a 6-way power driver's seat, tilt/telescoping steering wheel, Reverse Sensing System, fog lights, front and rear air conditioning, an MP3-compatible CD player, and a leather-wrapped steering wheel. Specifying the Limited trim adds heated front seats, a 10-way power driver's seat with memory, Sony Premium audio with Ford SYNC communications system, a heated steering wheel, voice-activated navigation, leather upholstery, a power-folding 3rd-row seat, and 19-inch alloy wheels. Standard safety equipment includes 3-row side-curtain airbags and inflatable 2nd-row safety belts. Options for the 2015 Ford Flex vary by trim and include the 365-horsepower EcoBoost V6 (Limited only), all-wheel drive (SEL and Limited), a rearview camera, a power rear liftgate, heated 2nd-row seats with power Autofold mode, 2nd-row captain's chairs with a center-console refrigerator, a 4-panel Vista roof, a contrasting-color painted top panel, remote start, a rear-seat DVD entertainment system, and the Park Assist active parallel-parking aid. Across its trim levels, the 2015 Ford Flex offers a choice of two V6 engines (both with a 6-speed automatic transmission) and either front-wheel drive (FWD) or all-wheel drive (AWD). The standard engine is a smooth and efficient 3.5-liter V6 with variable valve timing. It makes 287 horsepower and is certainly adequate if not class-leading. Fuel economy is quite good for the vehicle's size with an estimated 17 mpg city and 24 highway. All-wheel-drive models earn slightly lower estimates. The Limited trim offers the option of the EcoBoost V6, which has twin turbochargers and direct injection to produce an impressive 365 horsepower. This EcoBoost engine is offered only with AWD. The Manufacturer's Suggested Retail Price (MSRP) for a 2015 front-wheel-drive Ford Flex SE starts just under $30,000. For the mid-level SEL, prices start around $33,000 (FWD) and $35,000 (AWD). A top-of-the-line Limited begins just under $39,000 with the base engine and FWD and bumps up against $43,400 with the EcoBoost V6 and AWD. Heavily optioned, a Flex Limited can easily exceed $50,000. That pricing is in line with such competitors as the Chevrolet Traverse and Honda Pilot. To make your best deal, be sure to check our Fair Purchase Price and see what typical Flex transaction prices are in your area. Considering resale value, Kelley Blue Book expects the Flex to hold a good portion of its original purchase price, on par with the Chevy Traverse, but falling slightly behind the Honda Pilot.